Aglaonema 'Cory' One of my favorites, yet not much different from a Dieffenbachia. I am generally very good at houseplant identification. I am usually able to tell to which genus an unfamiliar plant belongs without much difficulty. However, I am both cactus and palm blind. With the exception of certain very distinct groups (Astrophytum, Opuntia and occasionally Mammillaria) I can't seem to learn how to tell one cactus genus from another. I can recognize Rhapis and Caryota, but I can't tell one fan palm genus from another, and get totally, completely confused by all of the narrow-leaflet palms. I like to think of myself as pretty smart. I am definitely pro-science, and I refuse to fall back on common names, but I do find myself annoyed and frustrated by plants with complicated taxonomy. An example would be Haworthias, which often have not only a genus and species, but a subspecies and a variety name as well. Orchids are, of course, the champions of complicated nomenclature. 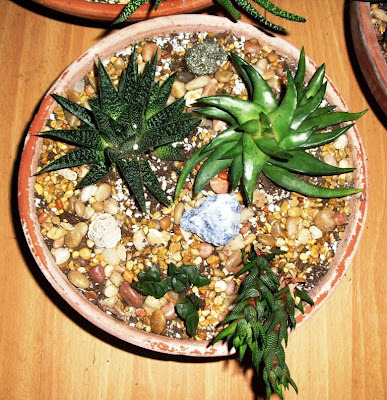 The Haworthia on the top right is a H. starkiana, on the bottom right is a H. reinwardtii. I'm happy to know that much. Somewhat related to the above: No matter how hard I try to retain them, I always lose plant tags. I have a good memory in general, and 99% of the time, I don't need a tag to remember the names of my plants. I tend to dislike how tags look sticking up out of my pots. But when I need a tag, I really need one. Like for the Haworthias and Orchids. I've gotten to the point where I am content, most of the time, to just know what genus I have. I'm particularly happy if I know the species. Subspecies be damned! 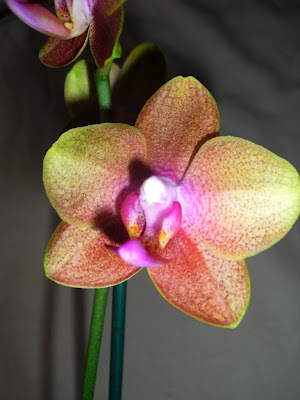 This Phalaenopsis was on clearance, most likely because the tag was missing. Apparently I'm not the only one who has trouble holding on to them. And there is one time when I actually enjoy not knowing which plant is which. I have eighteen Hippeastrums (popularly known as Amaryllis) and I've lost the tags for most of them (some never had tags--I've bought a few NoIds at a discount on eBay.) So whenever I get a bloom stalk, I have no idea what color flower I'm going to get until they are about to open. I generally regard this as a nice surprise. Wow, I just love the Aglaonema 'Cory'. I've never seen it before; just lovely. Don't sweat over the cactus and succulent ID's -- sometimes even the experts have trouble telling them apart. If you want an ID for a cactus or other succulent, check out www.cactiguide.com and post a pic in the identification section of the forum. Celtic Rose, I don't sweat over IDs really; I just find it odd that I seem to have blind spots when it comes to cactus and palms. I only have one cactus of my own that I haven't been able to get ID'd. I just call it "that tall thin one", and am happy enough. I've tried studying pictures and I just don't see what the defining characteristics are. Just like some people can't see the differences between pothos and heart-leaf philodendrons, even though those differences are obvious to others. I don't expect to be able to tell the exact species at a glance, I'd just like to be able to tell one cactus or palm genus from another.